This is a sponsored post, all opinions and comments are 100% my own. Affiliate links have been included in this post. I was given product to participate in this months contest. Happy August! I can’t believe the summer is coming to an end! 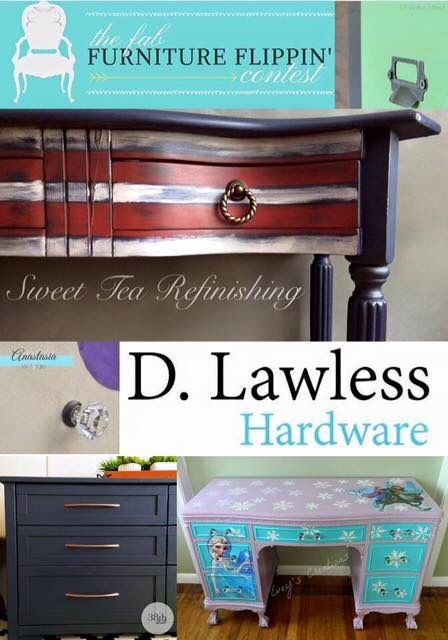 And what better way to end it with another fun Fab Furniture Flippin’ Contest challenge using D.Lawless Hardware! This month the challenge was “Class It Up”! When I decided to enter the D. Lawless Hardware challenge for August’s Fab Furniture Flippin’ Contest this month I wasn’t quite sure what kind of piece to paint and what kind of hardware to use. I knew that the theme of this contest was “Class It Up” so I wanted to pick a piece of furniture and hardware that was timeless and could work in almost any decor. D.Lawless Hardware is an awesome website and has ooodles of selections to choose from and I didn’t really know where to start. I finally stopped looking when I found these amazing antique style milk glass knobs. I wasn’t sure what kind of piece of furniture I was going to put these on but I had to have them! 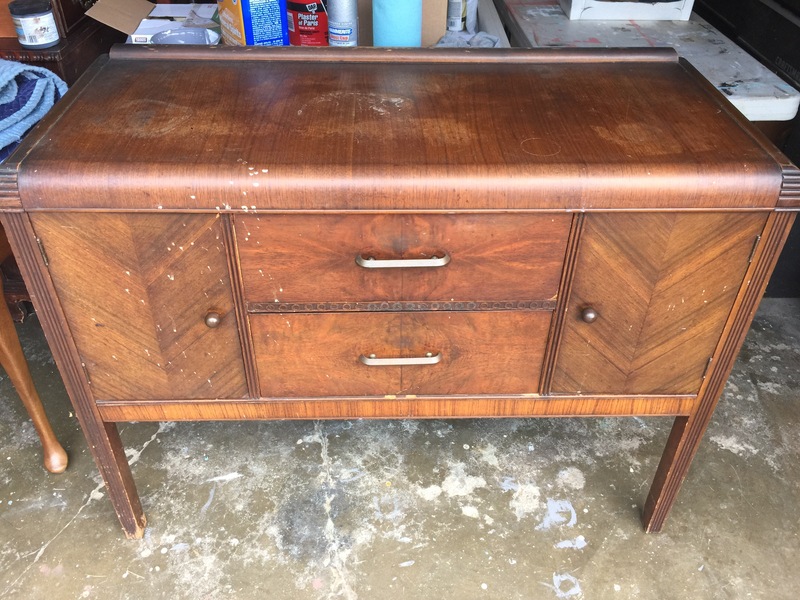 When a friend texted me and told me that this fabulous mid century Art Deco buffet was sitting on the side of the road, I knew I finally had my inspiration! My son and I loaded it in the car and I couldn’t wait to start on this beauty! It was a little beat up, missing some veneer here and there and a bit wobbly, but it had great bones and I knew that I could make this piece of furniture come to life once again. I used Citristrip to strip off any old lacquer or stain that had been on the fronts of the drawers and on the doors. I then used my palm sander to get rid of any remaining debris. I started with a coarse grade of sandpaper and then finished with a finer grade. I sprayed the body of the piece with shellac first because I knew I wanted to paint it white and it would have a lot of bleed through. I also repaired any damaged veneer by filling it first with a high quality wood filler and then sanding it smooth. I primed the area that I applied wood filler before using the chalk paint over it. I used Rustoleum’s Chalk Paint in Linen White to paint the body of the piece. It took about 3-4 coats to fully cover. I knew the white milk glass knobs I chose from D. Lawless Hardware would really pop off the contrast of the wood. I wanted to use matching milk glass handles for the drawers which D.Lawless had, but the measurements didn’t line up. I didn’t want to start filling in holes and making new ones so, I decided to just use the knobs instead. I used an old sock to apply the English Chestnut stain by Minwax to stain the doors and drawers. I used about 2 coats and then used Minwax oil based rub on polyurethane to finish. And here is the final result! How fabulous is this piece now? I totally am in love with the way these knobs look on here! I don’t even miss the handles! The quality of the knobs is top notch, they are not chintzy at all, and have a nice weight to them. They really pop and they make the piece look so elegant yet timeless! I love how they are in keeping with the 30’s Deco era. A little closeup of those beautiful knobs! Stunning. I used Rustoleum’s matte sealer on top of the chalk paint to give protection. The D.Lawless Hardware milk glass knobs give this piece just the right touch I think! Previous Post Old Fashioned Milk Paint July Fab Furniture Flippin’ Contest “Farmhouse Fun”! Just love this update! Pinned! Love pairing paint with a wood finish, very classy transformation! 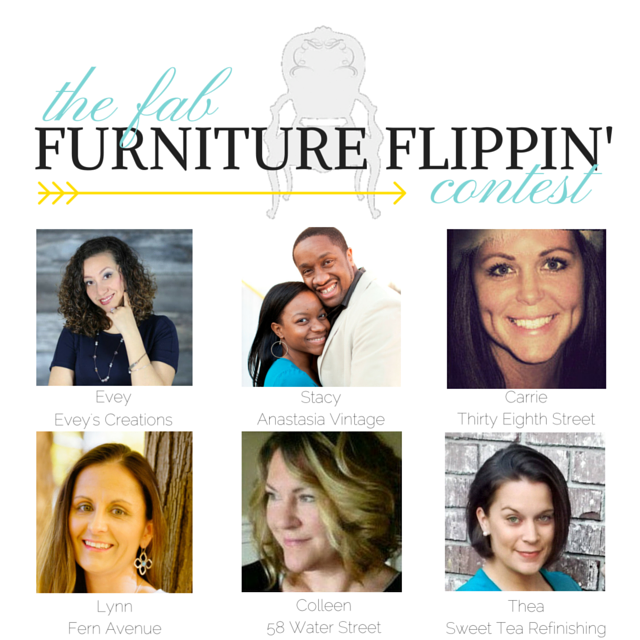 Fab Furniture Flippin’ April Contest Cut and Paste with O’verlays!